Witness a wonder that won’t occur again in our lifetime (well, unless we live another 105 years). You don’t have to be a stargazer to notice Venus: Sooner or later, everyone catches sight of our closest planetary neighbor, the brightest “star” in the night sky. (In recent months, she’s been showing off in the west at dusk.) 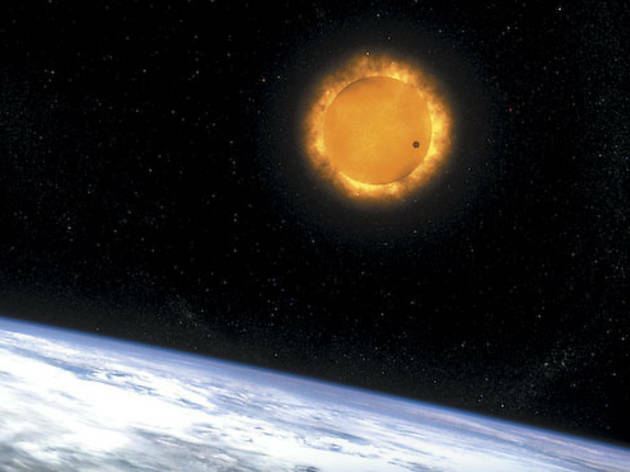 The world will experience an irresistible Bizarro version Tuesday 5 when Venus appears as a black dot slowly crossing the sun’s face. Called a “transit” by astronomers, it’s like a solar eclipse, but with Venus in place of the moon and much smaller in appearance. Extremely rare events, transits of Venus occur in pairs eight years apart, then not for more than a century. The phenomenon won’t happen again until 2117. On Transit Day, from 4 to 9pm, the Adler Planetarium hosts a free viewing party. Peer safely through filtered telescopes as the transit begins at 5:04pm, or head inside (if the skies are cloudy, boo!) to watch a live feed from NASA in Hawaii. On the other side of Lake Michigan, Indiana events include a bus tour involving visits to Notre Dame campus and Warren Dunes State Park, where people can watch until the sun sets over the lake, followed by a celebration with ale from a local microbrewery. Visit transitofvenus.org/trove for more details on the Indiana events.